For many children, the Easter bunny is the foremost symbol of the Easter holiday. And for some, a rabbit’s connection with eggs and Easter might raise a few puzzling questions. But history gives some clear answers related to the mysterious tale of the Easter bunny. Like the holiday itself, the Easter bunny and its eggs come down to us from ancient pre-Christian traditions that were adopted and absorbed by the Roman Catholic Church. Rabbits, or hares, and eggs were common fertility symbols in the spring festivals of renewal and regeneration celebrated by ancient civilizations around the world. Some of the earliest written records of these rituals come from ancient Egypt; they date from as early as 2300 B.C.E. and are built on even earlier oral traditions. Some of the themes in the writings—such as hare gods, the world springing from an egg, the death of a god, sunrise services and resurrection (much like today’s Easter celebrations)—converged in the stories surrounding Osiris (a sun god) and his sister/wife Isis (a moon goddess). Variations of their mating, death and spring-rebirth tales reappear in later incarnations, including stories of Inanna and Dumuzi, Ishtar and Tammuz, Aphrodite (Astarte) and Adonis, Cybele and Attis. Themes and symbols of fertility, rebirth and renewal of life often included eggs and prolific rabbits. Hares were sacred to Eros (the Greek god of love, also known as Cupid in Roman mythology) and to Aphrodite (Greek goddess of love), both said to have been born from eggs. The Catholic Encyclopedia credits Bede with claiming that the English word for Easter “relates to Estre, a Teutonic goddess of the rising light of day and spring.” Although they may be of more recent origin, images and tales of Estre (Eostre, Ostara) involve symbols of eggs and hares as well. 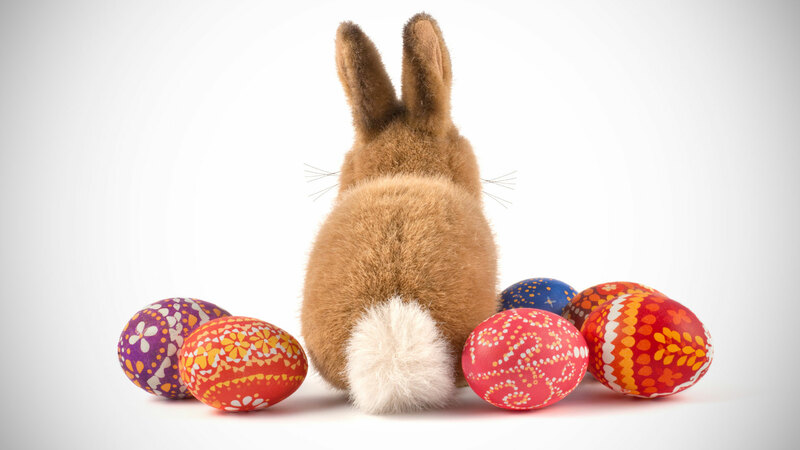 In 1682, physician G.F. von Franckenau penned what is considered to be the first written account of colored Easter eggs supposedly left by the Easter hare (Oster Hase), describing it as an established Alsatian tradition. The idea of the Oschter Haws (Osterhas), or Easter hare, arrived in America with European immigrants in the early 1800s. This hare supposedly left gifts of colored eggs around the homes of well-behaved children on the eve of Easter, and bakers started shaping breads into a hare laying an egg—with an actual egg pushed into the dough and baked with the loaf. The hare of antiquity turned into a rabbit as Easter celebrations spread throughout the rest of the country as well as into other cultures. Worldwide traditions include Easter egg hunts, baskets of stuffed toy Easter bunnies, chocolate bunnies and candy eggs, and cards featuring the Easter hare or bunny. Although most people who observe the holiday have no idea of its ancient pre-Christian origins, the ancient tale of the Easter bunny continues to play a major role in today’s Easter celebrations around the world.